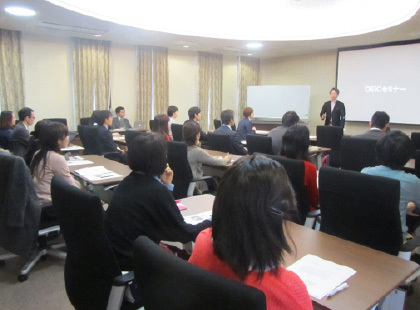 On the 19th of March 2015, the TOEIC Score Improvement Seminar was held for the university staff. The purpose was to further improve the staff’s language ability, in order to promote globalization at the university, upon the adoption of the Top Global University Creation Support Project. 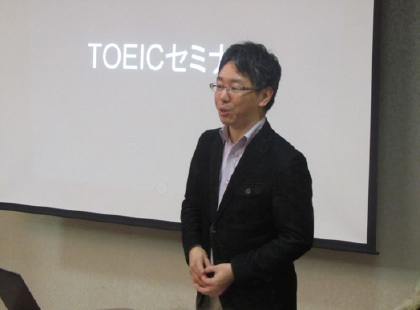 Twenty-two staff members participated in the 3-hour seminar led by Mr. Hiro Maeda who has written many books related to qualification tests but mainly for TOEIC. The seminar covered strategies for tackling each test section and recent trends in TOEIC questions were explained. Ways of learning English in a broad sense and case examples of utilizing TOEIC study to improve communication abilities in English were also covered. Many participants commented that the seminar motivated them to study English and that they would like to take a TOEIC test. Many asked for another seminar to be held, and others asked for a seminar targeted at students. The seminar was therefore deemed a great success. This program has been planned in order to provide an opportunity to the undergraduate students from abroad to experience the rich culture of Japan and Kumamoto. The students will be invited for a short stay in Kumamoto, and the invitation is open to the undergraduate students studying in universities having agreement with Kumamoto University for academic or student exchange. The “Overseas Study Promotion” Fair is held to awaken newly-admitted students’ interest in studying abroad. At the fair students can find out about the various types of overseas study available to them, from 1-month language training courses to exchanges abroad which last approx. 1-year. There is also information regarding grants available to students when studying abroad, as well as the language ability required for studying overseas.